HomeWork: Whether you're building a new kitchen or remodeling an existing one, here are some tips to keep in mind as you start the process. Q: Give me everything you’ve got on the craft of kitchen cabinetry. A: Whether you’re building a new kitchen or remodeling an existing one, here are some tips to keep in mind as you start the process. Before you get started, it’s important to know that there’s typically a four- to six-week lead time when ordering your cabinets. This means that once you’ve gathered all the dimensions, made all your material choices and placed the order, your cabinets will take around about a month to arrive, depending on how customized they are and which vendor you use. How do you use your kitchen? One helpful design tip is to create an equilateral triangle between the sink, refrigerator and stove — it creates an easy flow of activity. Where will you store pots and pans? Do you want open shelving? Where will the garbage and recycling go? What about a dishwasher? It’s important to know critical dimensions when planning your cabinet layout. Consider plumbing, gas and electric for appliances, and doors and windows you’ll be working around. As you gather these measurements, remember to measure from the outside of any trim or casing, rather than the inside. And don’t forget to measure your ceiling height — this will determine the height of your cabinets. Once you’ve considered the layout and gathered measurements, sketches and photos, it’s time for the fun part: choosing your cabinets. View your cabinet options in person at a showroom if possible — it will help you visualize the cabinets in context. Bring along any inspirations and references, whether it’s a kitchen you saw in a magazine or an entire Pinterest board. To get you thinking, here are some of the choices you’ll be making. Cabinet face. Do you want framed or frameless cabinets? Framed cabinets have a more traditional look. Frameless cabinets are often referred to as European-style. Other than the aesthetic, the biggest difference between these two options is that a framed cabinet has … well, a frame, which means there’s more space between the doors and drawers. Wood type. For the box, consider plywood — it’s stronger, especially in sink bases. Particleboard has improved tremendously over the years, but it will still deteriorate faster in water than plywood, and an under-sink leak at some point in time is almost inevitable. Door-wise, you have options. Oak has an open grain; beech has a huge variation in grain (the darker you stain it, the more pronounced the differentiation); and maple is popular because it’s dense with a tight grain that has a nice, smooth finish when painted. Cherry and black walnut are great choices, too. Beyond this, the face of the doors and drawers are customizable — consider inset, full overlay or partial overlay. Finish. Staining and painting are typical options. Hardware. 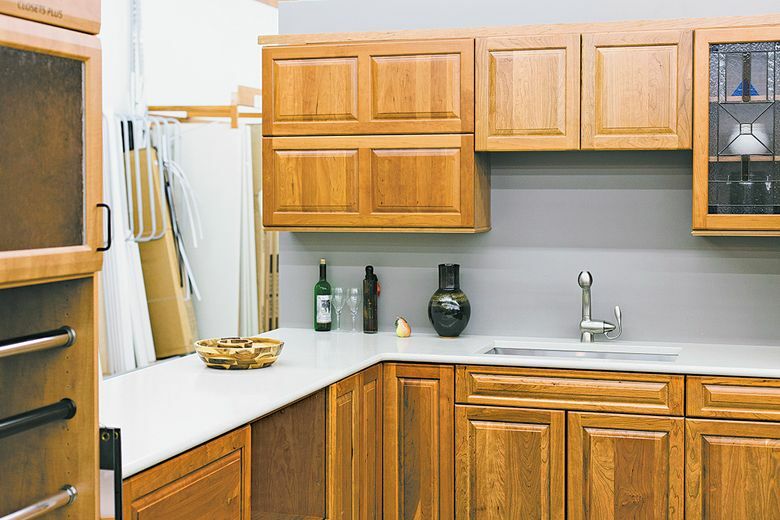 From the way your drawer slides to the sound your cabinet door makes when it closes, there’s opportunity for cabinet and hardware customization, including the color and material of your pulls and hinges. You may be tempted to order your cabinets on the spot, but it’s a good idea to go back to your space and revisit the decisions you’ve made. Do the cabinets you’ve designed still make sense in the space? If so, place your order — and try to wait patiently until delivery day. Eric Jaeger is a cabinet specialist at Dunn Lumber and a member of the Master Builders Association of King and Snohomish Counties, and HomeWork is the group’s weekly column. If you have a home improvement, remodeling or residential homebuilding question you’d like answered by one of the MBAKS’s more than 2,900 members, write to homework@mbaks.com.